At the May meeting of the Delta Stewardship Council, Delta Watermaster Michael George discussed the recently completed study: A Comparative Study for Estimating Crop Evapotranspiration in the Delta which compared seven different models and methods of estimating the consumptive use of different crops grown on the Delta’s numerous islands. 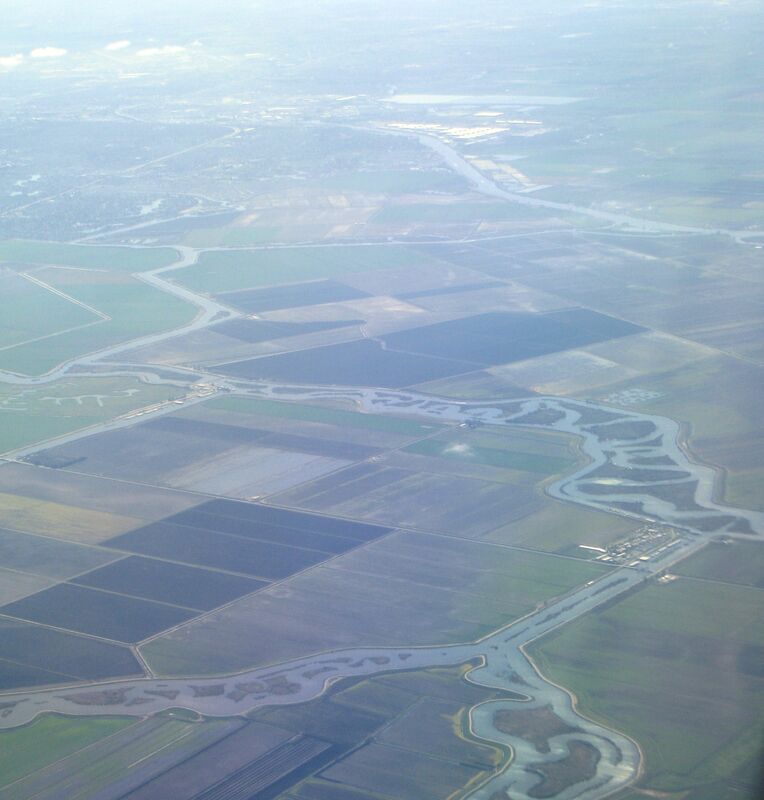 Considering that agriculture accounts for the vast majority of land use within the Delta, the consumptive use or evapotranspiration of crops grown there is important for managing water as it flows in and through the Delta’s channels, the hub of California’s water system. The Delta is both a transfer point for water stored in reservoirs on upstream tributaries and a source of otherwise free-flowing water for in-Delta water-rights holders. 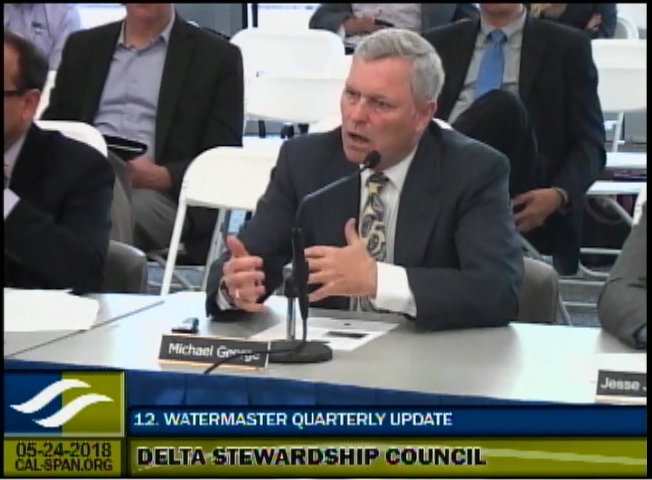 While the amount of water diverted from the Delta by the State and federal water projects is well known, less is known about the amount of water taken and consumptively used (meaning not otherwise returned to the Delta in forms such as waste flow or runoff) by local in-Delta diverters. This consumptive use is measured as evapotranspiration, which is defined by the USGS generally as the water lost to the atmosphere from the ground surface, evaporation from the capillary fringe of the groundwater table, and the transpiration of groundwater by plants whose roots tap the capillary fringe of the groundwater table. 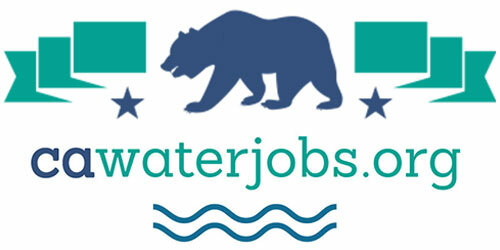 Given the State’s system of cascading water rights in which upstream return flows are factored into downstream water rights, measuring and understanding consumptive use within the Delta is important not only to farmers but also to water facility managers, water rights regulators, and to those seeking to protect the Delta’s human and natural ecosystem. The lack of accurate and timely understanding of crop consumptive use hampered water management and regulation during the multiyear drought; however estimating crop consumptive use is inherently difficult in the complex setting of the Delta, he said. The Delta is big, varied, complex, and hard to figure out. 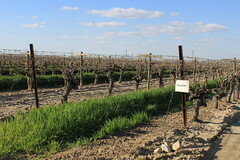 Land use is very dynamic; it’s not static, a field that was devoted to tomatoes this year maybe devoted to alfalfa next year and may be migrating into grapes or orchards in the following year. 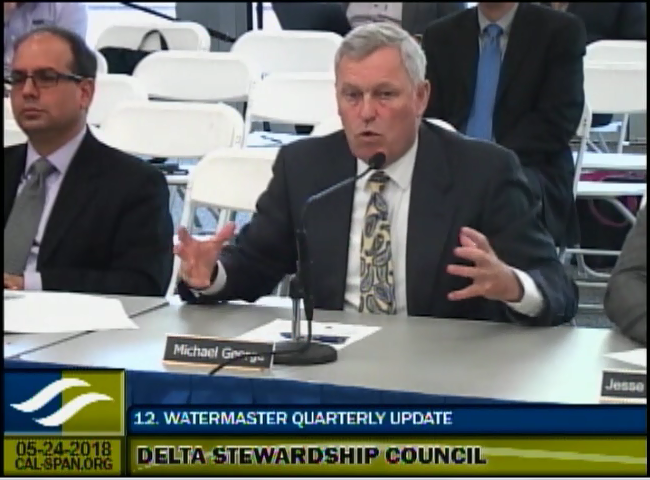 Land use decisions in the agricultural sector is critically important to what the demands are and how water is used in the Delta, Mr. George said. 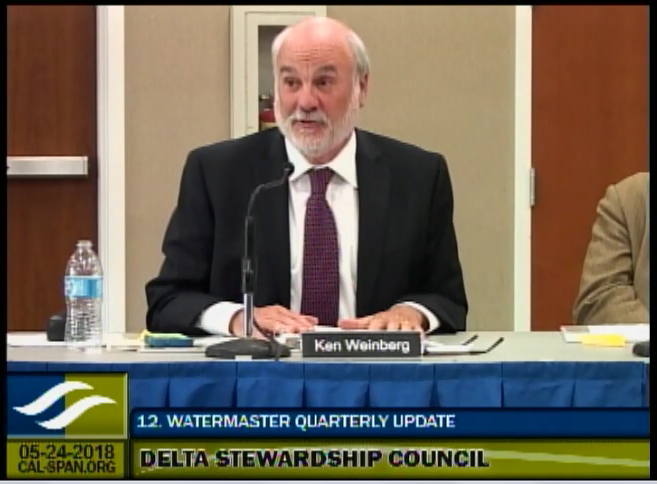 “How we regulate extractions from the Delta both internally and for export, how we manage those projects, how we administer the water rights system, and very importantly, how we manage the evolution of agriculture and ecosystem restoration in the Delta depends on understanding these relationships,” he said. 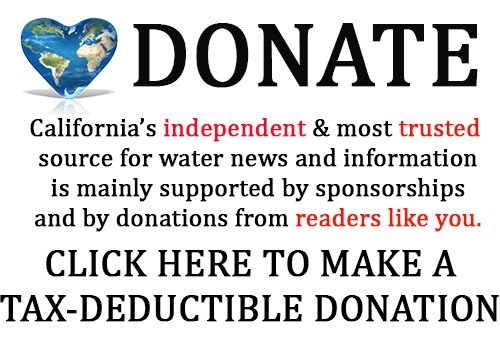 The study originated at the suggestion of then-Vice Chair of the State Water Resources Control Board, Fran Spivy-Weber, with help from fellow board member Tam Doduc. They pulled together a ‘coalition of the willing’, which was a wide variety of people who had an interest, who could contribute to the understanding, and who would be meaningfully impacted by what was learned; they came together voluntarily to look at the state of the current science, he said. They would improve utility of all methods through peer-to-peer collaboration and not have the study be a contest to pick a winner. The study identified seven models and methods for estimating consumptive use in the Delta which have been developed; all of them had been subject to peer review and were methods that are in wide use. 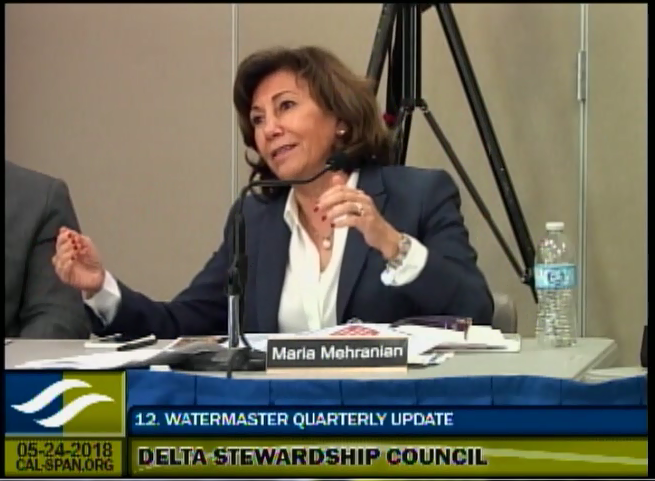 The study was funded by state agencies, including the State Water Resources Control Board, the Department of Water Resources, the Delta Stewardship Council, and the Delta Protection Commission as well as the in-Delta water agencies; there were also significant in-kind contributions. Research participants included the USDA, and private consultants. 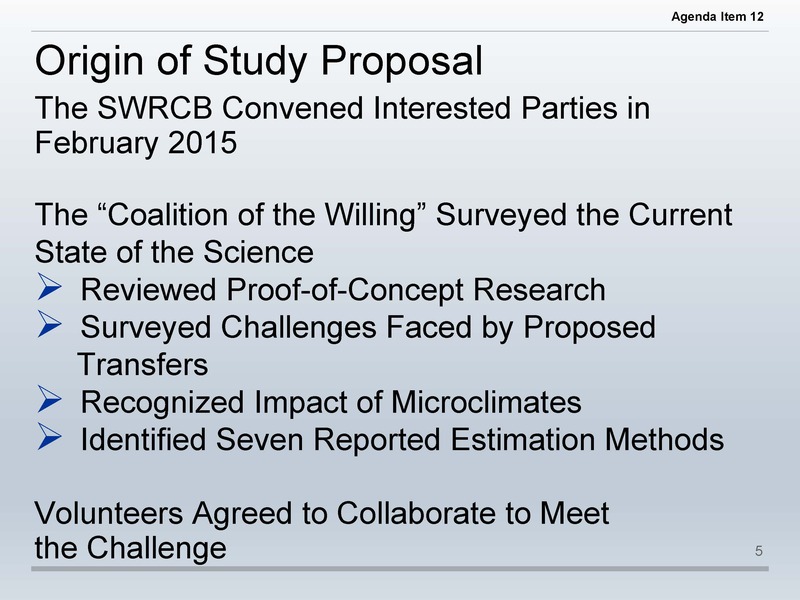 Jesse Jankowski, Graduate Research Assistant Center for Watershed Sciences, then described how the study was organized. There were seven different models and methods for estimating consumptive use; the goal was for each of the methods to have a separate and independent sponsor that would subject to them to comparison and allow collaboration to improve all of them collectively, he said. Two of those models are used by the Department of Water Resources for water planning both statewide and specifically within the Delta; five of them were from academic and federal teams that use remotely sensed satellite imagery to develop estimates of evapotranspiration. 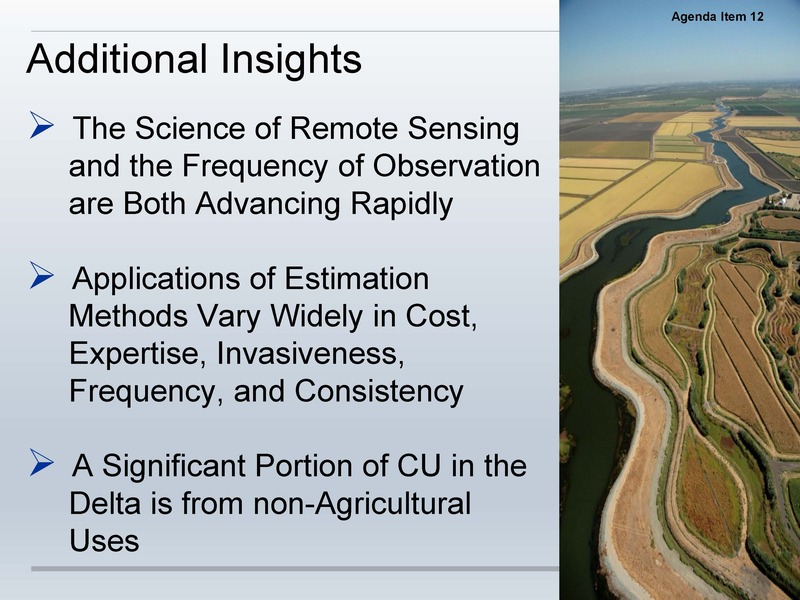 The UC Davis Land, Air, and Water Resources department captured field level calibration data for these models by setting up meteorological weather stations similar to the CIMIS network, but it was an independent effort dedicated to the study. The Center for Watershed Sciences team acted as the central team that collected, organized, maintained, and analyzed all of this data produced in the study without being intimately involved with any one of the models. All of the results of the blind tests and methods were submitted and analyzed, utilizing common data sets; each of the models improved with the final year of study. They then looked at detailed comparisons between the models which allowed them to understand why the results may be similar or different for certain areas and certain crops at different times of the year. The accuracy of all these methods with the collaborative interaction and improvements in common datasets did improve their agreement on the nature of evapotranspiration; all methods by the end of the study were brought within 11% of the mean across all seven of them and in many cases, much less than 11%, said Mr. Jankowski, noting that plus or minus 10% is very good for a region as large as the Delta. However, Mr. Jankowski said the study did illuminate some systemic differences between the different methods that are inherent to the assumptions and the modeler judgement required as an input to these types of estimates; these things may not always agree due to unique aspects of each model. 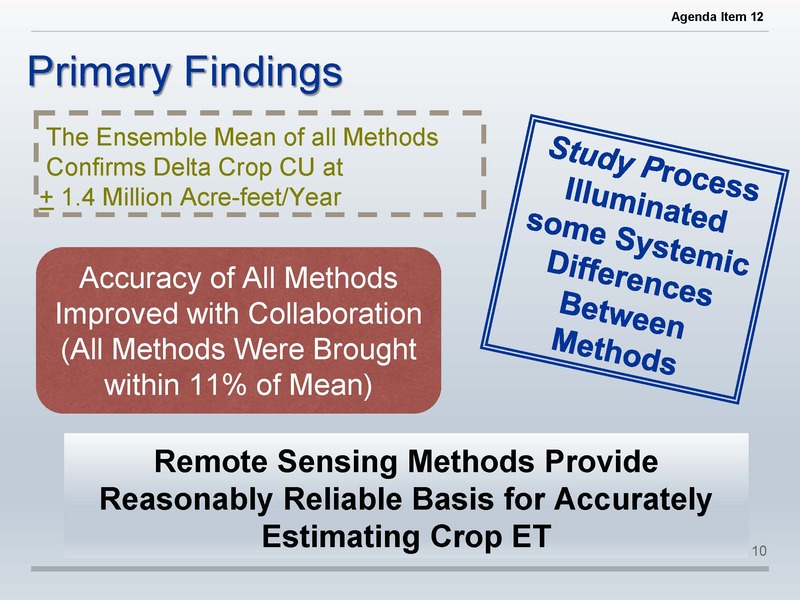 “Nevertheless, these remote sensing methods that are using the satellite data provide a very reasonable estimate basis for estimating crop ET, specifically within the Delta and elsewhere,” he said. 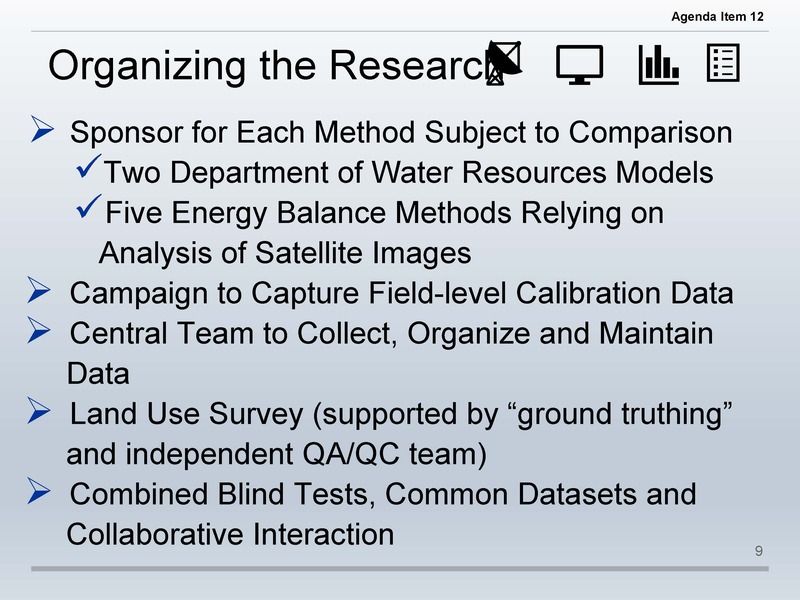 The seven methods that the study compared varied widely in terms of the cost required to implement them, the expertise from the people operating them, the invasiveness of if ground level calibration data is needed or if it’s all satellite-collected data, the frequency of the estimates, and how consistent they are, especially in a widely varied place like the Delta. 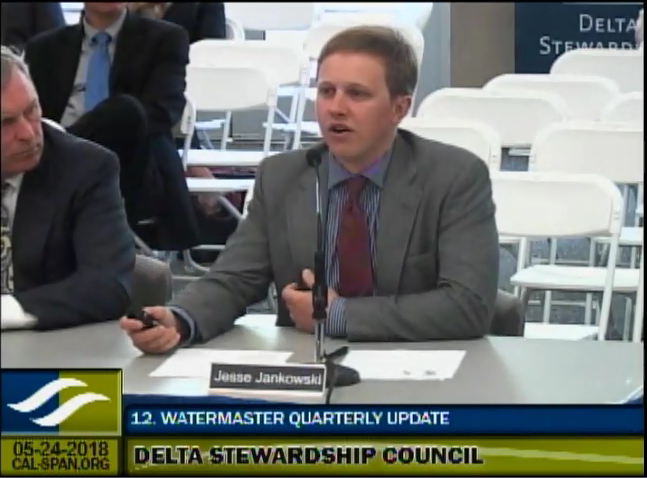 The major focus of the study was crop consumptive use from agricultural lands, which was estimated at 1.4 MAF; however, Mr. Jankowski pointed out that a significant portion of consumptive use in the Delta may originate from non-agricultural lands, such as open water in the channels, urban areas, or particularly natural vegetation. Next, Dr. Josué Medellin-Azuara, Associate Director of UC Agricultural Issues Center at UC Merced, discussed some of the policy implications for the study. “I am convinced that this study demonstrates the capacity of the agencies, the participants, and the scientific community stakeholders to collaborate in estimating crop evapotranspiration and consumptive use at the field level,” he said. 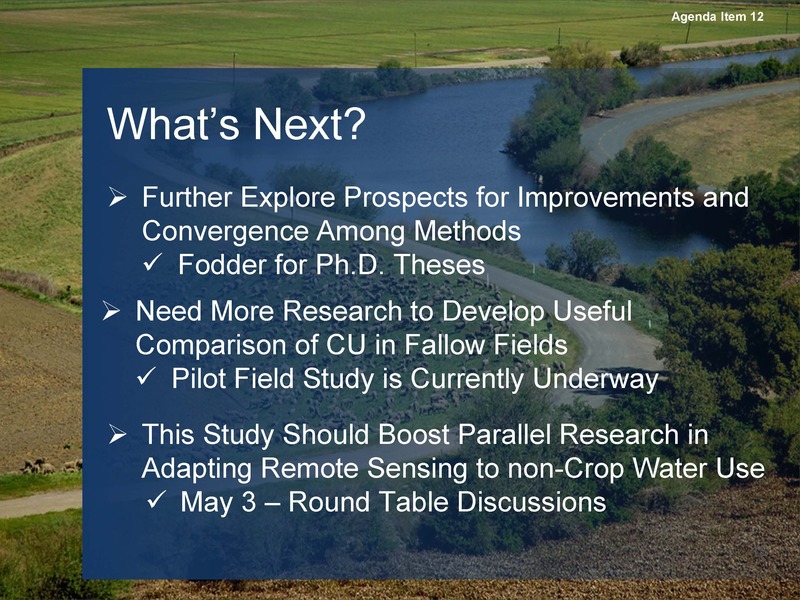 Mr. Medellin said they have thousands of data points of evapotranspiration estimates for each of seven fields for two years; it is material for a thesis or future studies and is worthwhile examining. However, at this point, they feel they have already obtained great insights. “We have a lot of data points to explore about how conversions of one meadow might decrease using more standardized datasets and other assumptions,” Mr. Medellin-Azuara said. More research is needed on the evapotranspiration of fallowed fields. Mr. Medellin-Azuara said there is a limited bare soil evapotranspiration estimates; over the course of the study, it was realized that they would benefit from having an expanded field campaign on bare soil, so this is in the ongoing study this year. 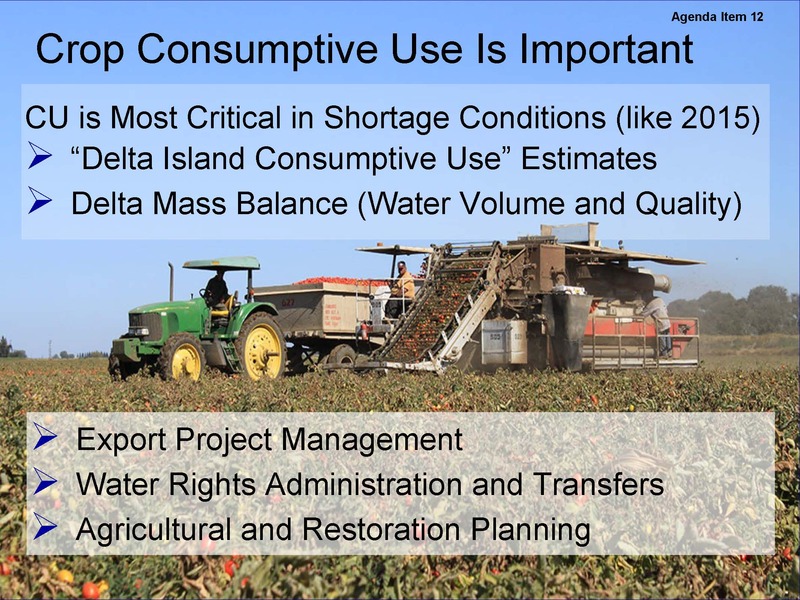 Also, a large proportion of the consumptive use in the Delta that comes from non-agricultural land use classes, so having some estimates on non-crop water use is also a fundamental piece. 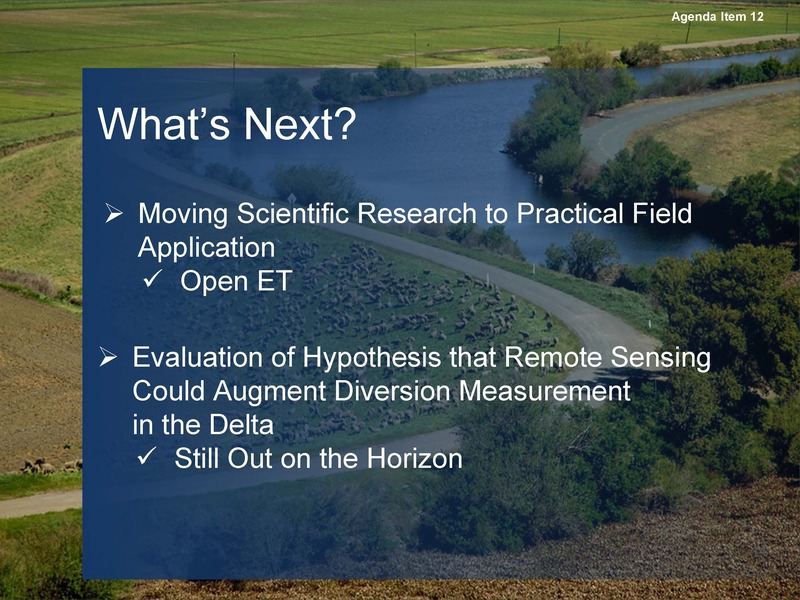 They will also be evaluating the hypothesis that remote sensing could augment diversion measurement in the Delta to see if this could be a surrogate which would reduce the burden for self-reporting on diversions and other issues, he said. 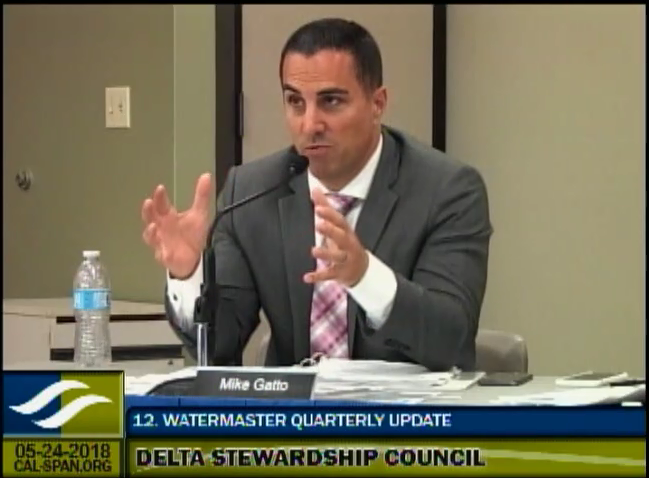 Councilmember Mike Gatto asked about water use in the Delta. If somebody owns a farm or buys a farm, can they pump whatever water they need? 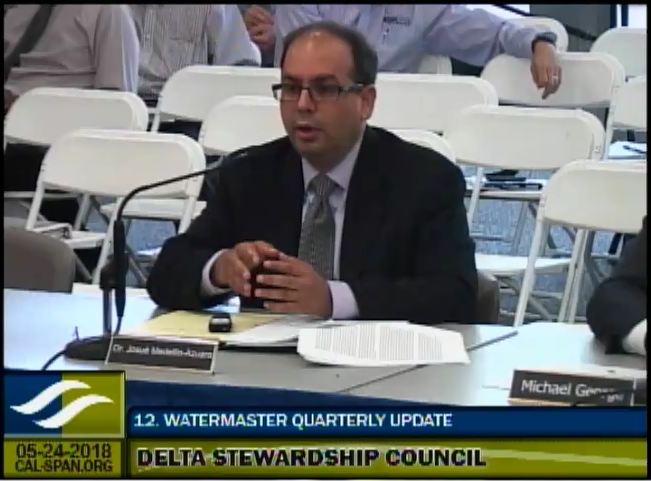 “It sounds like the need for this study was that there are very few water users in the Delta who are metered as we tend to think of it,” said Mr. Gatto. “The estimate of 1.45 MAF in 2015, did that surprise anybody?” asked Mr. Gatto. 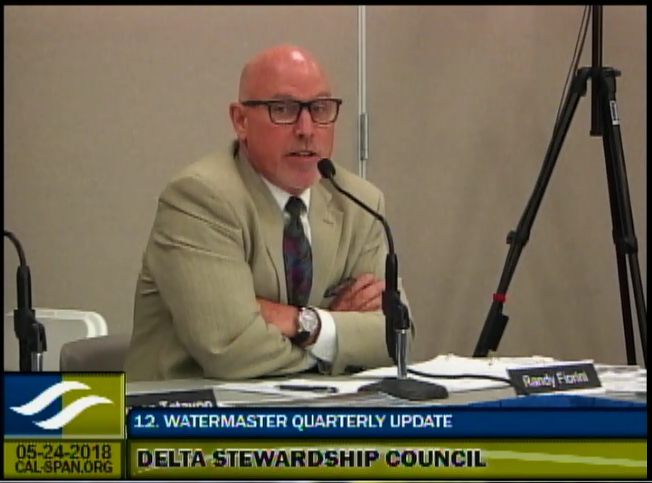 “The Delta Plan in 2013 estimated a range of in Delta water use at .7 MAF to 1.1 MAF with an average of .9, so this is a 50% increase over that estimate,” said Jessica Pearson, Executive Director. 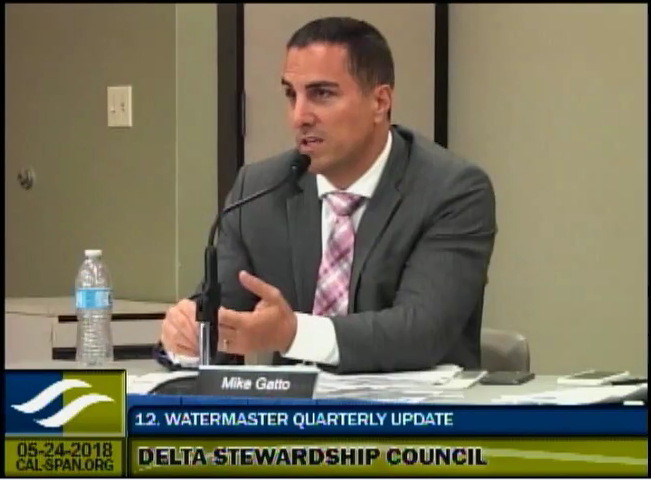 “Compared with the other California state uses of Delta water, do you know off the top of your head a rough estimate of how much is pumped out of the Delta in terms of acre-feet so that we can have a comparative statistic for these numbers?” asked Mr. Gatto. 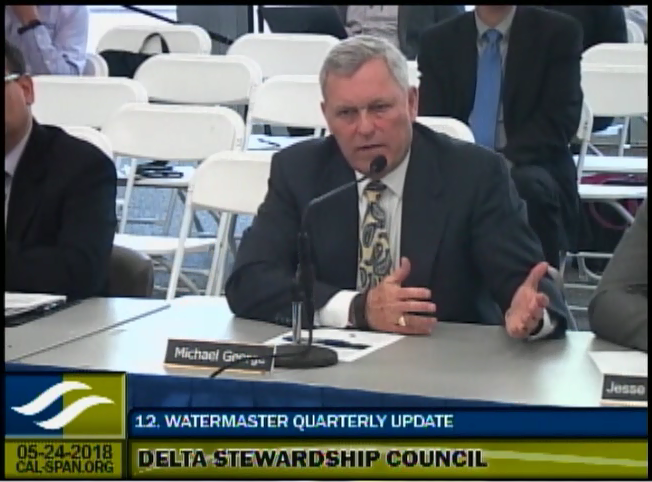 “The projects are, in addition to their exports, responsible for maintaining low enough salinity in the Delta for all beneficial uses, so a lot of what was happening in 2015 was that precious previously stored water in reservoirs was released specifically for the purpose of maintaining the water quality in the Delta,” said Mr. George. Councilmember Ken Weinberg noted that urban water agencies have to measure their water use; trying to measure ag water use is the bar that is set. 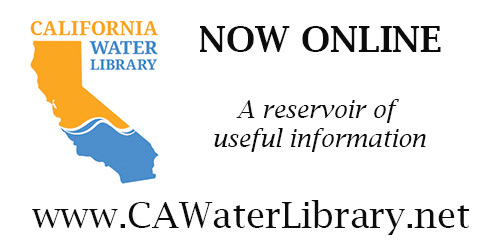 Michael George said that the implementing regulations for SB-88, the legislation to measure water use, were adopted by the State Water Board and things are definitely moving in that direction. For the agenda, meeting materials, and webcast link, click here.